The mean Integrated Sachs–Wolfe imprint of RPC-313 on the CMB, with color scale from -20 to +20 µK. Containment Protocols: All terminals on which RPC-313-S is viewable require Level 3 clearance or higher to operate. Access to the areas in which the terminals are located will only be granted via formal request to a Site Director. The time allotted to access the terminals must not be exceeded for risk of disciplinary action up to termination. Extreme cognitohazard precautions are to be used for research involving Object S-01.1 Lead Researcher ███████ must be consulted before any testing involving S-01 is conducted. While RPC-313 cannot currently be contained, it's rediscovery by non-Authority parties must be prevented, and to this end the ACI Information Control Sector have been tasked with suppressing its existence. These protocols hold until the probes ISO-Castor and ISO-Pollux have arrived at their designated destinations, at which point the Board will convene to determine how containment will be handled going forward. Description: RPC-313 (known as the Fischer-Greiss Void prior to containment) is an empty region of space located approximately 860 million light years from Earth, in the vicinity of the [REDACTED] constellation. Roughly ellipsoid with a diameter of 270 million light years, RPC-313 encompasses nearly 170,000 Mpc3 in volume. WMAP data implies that RPC-313's density of matter abundance is less than 0.01% of the typical universe average.2 The anomalous properties of RPC-313 are considered to be the causes of its abnormal lack of matter. Said anomalous properties were first discovered when a constant long-wave radio signal being broadcast seemingly from the center of RPC-313 was received by researchers in ████. The signal, once decoded, contained a detailed list of instructions which researchers used to establish a remote connection between Authority computer terminal T77 and a separate server at a currently unknown location. The server was discovered to be running a single program: a complete, real time simulation of a large region of space approximately the same size and shape of RPC-313 (referred to as RPC-313-S). The simulation differed from RPC-313 in that it contained matter at a rate consistent with that of the universe at large, including myriads of galaxies each with a requisite number of stars and systems. Observation is made difficult by the lack of any graphical representation of RPC-313-S, but by utilizing the incredibly detailed data the program provides, some exploration of the space has been done. [See Addendum SA for a catalog of important objects]. Researchers that have observed significant amounts of data associated with the object at the center of RPC-313-S (referred to as S-01) have suffered from severe mental deterioration, and as such S-01 has been designated a cognitohazard. Further details of the mental effects of S-01 can be found in Addendum 01-A. Former Lead Researcher ███████ is considered the most intensely effected subject of S-01, and is currently held in Psychiatric Rehabilitation Center ██. A full interview with ███████ is transcribed in Addendum 01-B. The structure of RPC-313-S is also anomalous. Research has revealed that the Anderson Constant3 of the space simulated by RPC-313-S continuously decreases as one travels from the edge to S-01. Close to S-01 the Anderson Constant approached zero, and researchers hypothesize that the center of S-01 represents an absolute zero Anderson Constant. If this is true, it would be the first instance of a true ACS-0 Class reality to have been discovered. Research on this aspect of RPC-313-S is ongoing. Communication has occurred between researchers and one inhabitant of S-06, the only currently known planet within RPC-313 to harbor life. It is unknown how the lifeform understood the messages of the researchers, or how it managed to contact them at all. Details of the conversation can be found in Addendum 06-A. Asteroid SR-3486Y was first observed by the ISO-Parmenides Extrasolar Telescope on 15-08-████ and determined to be the closest observable object to RPC-313. ISO-Parmenides was commissioned to constantly observe the object as it appeared to be moving towards the border of RPC-313 (it was later discovered that SR-3486Y was actually relatively stationary). Due to ISO-Parmenides position and the time required to capture the entirety of SR-3486Y's surface, full captures could only be done annually. Surface maps showing the deterioration of SR-3486Y as it crossed the border of RPC-313 over the course several annual captures. Once SR-3486Y began to pass into RPC-313, it was observed that the portions of the asteroid within the void would break down nearly instantly once past the border. ISO-Parmenides managed to consistently capture the asteroid's surface during this process. This vigilance was rewarded when researchers discovered that the portions of SR-3486Y that had disappeared correlated to portions of an asteroid that began appearing on the border of RPC-313-S. Researchers agree that this connection is not a coincidence. Foreword: On 13/02/████ a communication was received within RPC-313-S labeled as "LifeForm1". Researchers quickly responded, probing for information about the simulation. LifeForm1: Are you the person I'm supposed to contact? Researcher: I don't know. You can understand me? LifeForm1: Yes. Who are you? Researcher: A scientist. Tell me, do you live on a planet approximately 70% water, fourth from a star with 12 other planets in its orbit? LifeForm1: Yes. Do you not live on my planet? Researcher: No. I live elsewhere. Researcher: Now, tell me, do you ever feel doubtful of the authenticity of your world? LifeForm1: I'm not sure what you mean. Researcher: How would you respond if I told you your world resides inside a vast computer simulation? LifeForm1: I would say that I did not believe you. I know my world is real as I can see it. I can look, and I can feel it. The Wellspring provides and it does not lie. Researcher: The Wellspring? What is that? LifeForm1: That from which all things flow. And to which all things will return. The last light. The center of the spiral. Researcher: Is it the object at the center of your universe? What does it do? LifeForm1: I was told not to talk about it. LifeForm1: Can you not hear it? The timbre of its thoughts, its hunger, permeating all things? Researcher: Are you saying the Wellspring speaks to you? What does it say? LifeForm1: I am not supposed to say. Researcher: What happens if you disobey it? LifeForm1: I do not know what this word means. Stop this. Researcher: I just want to know about the Wellspring. LifeForm1: Stop. Do you not hear it screaming? Stop. Stop. Don't you remember what it did to them? Stop. Researcher: Did there used to be other inhabited worlds? What happened to them? LifeForm1: I have to stop this. I have fulfilled the purpose of this conversation. It will release me now. Know that it can see you. Closing Statement: Several attempts were made to communicate with "LifeForm1" again, none have been successful. COGNITOHAZARD WITHIN. CAUTION IS ADVISED. Object Designation: S-10 "Orchid Nebula"
Object Description: S-10 is the designation of a planetary nebula roughly 140 million light years from S-01. Believed to be the remnants of a stellar system of 6 planets, the nebula is formed around a star currently in its white dwarf sequence. At roughly 400 light years in diameter, S-10 is currently the largest known non-galactic object in RPC-313-S (excluding S-01). Researchers have noted the beautiful symmetries of the object based on its gravitational and electromagnetic data. Efforts are currently underway to accurately simulate the appearance of S-10 based on its information. Object Description: S-09 refers to an ice giant roughly 185 million light years from S-01. With a diameter of approximately 61,000 km, it is on the larger side for its planetary type. S-09 is notable for its position in relation to other objects within RPC-313-S. S-09 is a true rogue planet in that does not even orbit a galactic center, it exists in an empty space between galaxies. The closest galaxy to S-09 is 15 million light years away.5 Researchers have characterized S-09 as "lonely". It is currently unknown how the single planet managed to form so far from all other matter, and researchers are in the process of formulating an explanation. Object Description: S-08 is the designation for a ternary star system located roughly 23 million light years from S-01. Of the three stars, the most notable is the most massive: a class B9 star on the verge of supernova (labeled "the Sword" by researchers). The possibility of observing the effects a supernova would have on a ternary star system is what makes S-08 a notable object. Researchers have maintained constant observation of S-08 in preparation for the event. Object Designation: S-07 "Captain Franklin"
Object Description: S-07 refers to a type SBa barred spiral galaxy roughly 965,000 light years from S-01. At 113,000 light years in diameter, S-07 is of normal size for its type. What makes S-07 notable is the fact that it does not rotate, and is in fact completely stationary. Due to this, its galactic temperature is also abnormally low, giving it a distinct "frozen" appearance to many researchers. There is currently no natural explanation for the stagnant nature of S-07, researchers hypothesize that a bug in the programming of RPC-313-S is causing it. If this is true, S-07 is the only known glitch in the otherwise perfectly functional system of RPC-313-S. Research on S-07 is still ongoing. Object Description: S-06 is the designation for a terrestrial planet roughly 2 million light years from S-01. The fourth of 13 planets orbiting a main sequence Class F1 star. It is the only known object within RPC-313-S (aside from possibly S-01) to harbor life of any form. The composition and morphology of the life on S-06 is currently unknown, though the society appears to be advanced enough to have at least a basic access to computers. The conversation between researchers and an inhabitant of S-06 implies that other inhabited planets either exist or existed before being destroyed. No other life harboring planets or evidence of previously existing life harboring planets have been discovered within RPC-313-S. Object Designation: S-05 "Dr. Leach"
Object Description: S-05 refers to a star approximately 94,000 light years from S-01. Nearly 3,000 R☉ in diameter, S-05 was originally thought to be a solid object rather than a star as it seemed to emanate no light. However, closer inspection revealed that the light of S-05 was obstructed by a covering of immense arthropods (resembling those of the taxon Acari) roaming the surface. Said creatures are on average around 20,000 kilometers in length. How the creatures are able to survive the heat of the star or sustain themselves is currently unknown. It's hypothesized that the creatures are sustained by the consumption of the dead, though deaths appear to be rare for the species. The death of one of these creatures has not yet been observed by researchers. Object Description: S-04 refers to an interstellar cloud predominately composed of icy planetesimals roughly 93,000 light years from S-01. The average diameter of S-04 lies around 175 light years, however due to the anomalous nature of the cloud its size is not constant. S-04 is anomalous in that its shape is that of constantly shifting fractal pattern (specifically facsimiles of Julia Set fractals). Why the shape of S-04 is constantly shifting despite no detectable forces causing it is currently unknown. Research into S-04 is ongoing. Object Description: S-03 refers to an object 73,000 light years from S-01, theorized to be a living organism. At approximately two light years in length, if the object is animate, it would be one of the largest creatures currently known to the Authority. Though it does not move, it is theorized to be animate due to its "vocalizations" which slightly vibrate the outermost layers of its body. The frequencies of these vocalizations are consistent with what is predicted for cetaceans of its size. How a cetacean would survive not only at that size but in interstellar space is currently unknown. One hypothesis is that S-03 exists in a state of cryptobiosis, as evidenced by its lack of movement which implies a slowed metabolism. Studies attempting to validate this hypothesis is ongoing. Object Description: S-02 refers to a terrestrial planet roughly 68,000 light years from S-01. Composed mostly of carbon, researchers believe that the planet would have distinctive black color. S-02 is notable due its position as the single object orbiting a millisecond Accretion-powered pulsar. S-02 is also abnormally close to the pulsar, orbiting with a semimajor axis of only 0.21 AU. How S-02 remains unaffected by the constant radiation emitted by the pulsar or how it maintains its extremely close orbit is currently unknown. Being one of the closest notable objects to S-01, S-02 is considered by researchers to be one of the oldest objects in RPC-313-S as well. How such a stable system maintains itself in an area with such a low Anderson Constant is also unknown. The inner composition of S-02 is currently unknown. Object Designation: S-01 "The Wellspring"
A depiction of S-01 by Former Lead Researcher ███████, based on data gathered from RPC-313-S. Object Description: S-01 is the designation for the object perceived to be at the center of RPC-313-S. Little is known about it other than the propensity for matter that collides with it to be entirely deleted from the system. S-01 spans roughly 13 million light years in diameter, dwarfing even the largest galaxies in the physical universe. Viewing of data relevant to S-01 appears to have a detrimental effect on one's mental state. The victim will begin to develop a strong feeling of devotion and reverence towards S-01, even in some cases going as far as a religious worship of the object. It is postulated that directly viewing S-01 has a much stronger effect on the victim than viewing relevant data, but this theory has not been tested. Though much is unknown about it, the worship of S-01 and S-01 like entities is one of the most observed belief systems among alternate realities, the most fervent cults existing in lower ACS Class realities. Some instances of note are cataloged in addendum 01-A. The center of S-01 has been hypothesized to be of Class ACS-0, though testing on this has not been conducted yet. Statements made during the 06-A communication imply that S-01 possesses some level of sapience, though no observation has been made to corroborate this. Description: Rift N-25 opened to a landscape comprised of a granular sand-like substance of a currently unknown composition. As there were no light sources present, it was hypothesized that if any lifeforms existed they would be underground. Digging into the sand revealed large annelidous organisms in several disparate colonies. It was believed the creatures had no colonial intelligence until their tunnels were mapped via radar. The output revealed that the largest colonies dug tunnels in distinct spiral patterns, at the center the shape of S-01 was clearly visible. This was the first discovery of rudimentary organisms displaying a form of S-01 worship. How the creatures were able to accurately depict the shape of S-01 is currently unknown. Artifact recovered from Rift K-16. 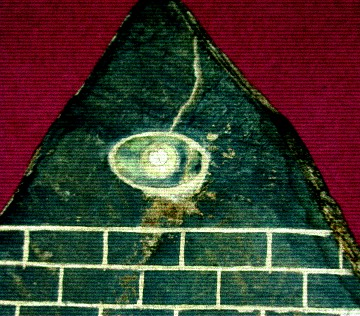 Believed to be a depiction of S-01. Description: Five stone stellated octahedrons several kilometers in diameter were detected hovering close to the Rift K-16 entrance. Closer inspection revealed them to contain colonies of twelve-legged arthropodal creatures. In the resulting skirmish with the creatures one of the vessels was downed by the Authority, and several samples of the stone structure were recovered. Carvings discovered on the stones greatly resembled S-01 as well as several other objects within RPC-313-S. The creatures which inhabited the structures are depicted in scenes of submission and servitude towards depictions of S-01. A partial carving appearing to show a tree consumed by flame was also recovered. Testing of the stone's composition and method of construction are ongoing. Description: A large grouping of structures comparable to a city was discovered within Rift W-33, completely frozen over and devoid of life due to the reality's exceptionally low baseline temperature. The only structure that could be entered appeared to be some kind of library or knowledge base. There were signs of a struggle, deep claw impressions in the floors and walls, as well as several structures appearing to have been burned. Of the books that still remained, only a few had not faded to the point of being unreadable. A significant portion of the books contained depictions of S-01 and other objects within RPC-313-S, along with extensive writings. The language used within the books has yet to be deciphered, and attempted translations are currently ongoing. Description: Reality accessed via Rift H-08 was initially deemed too unstable to be of any use research wise, the entire space dominated by matter in phases with less than quarkic degrees of freedom. However, an accidental discovery of particles that were able to form within the space had some troubling implications. The particles only appeared in disparate clusters each in the distinct shape of S-01. Research into how this is possible within Rift H-08 is ongoing. Allen: Hello, ███████. It's been a while, hasn't it? How have they been treating you? Allen: Do you know why they put you here? ███████: I can only assume it's because they don't condone my beliefs. Allen: I'd hardly characterize it that way. Allen: Do you recognize this? ███████: It's one of my drawings of the Wellspring. A little inaccurate but it conveys the idea. 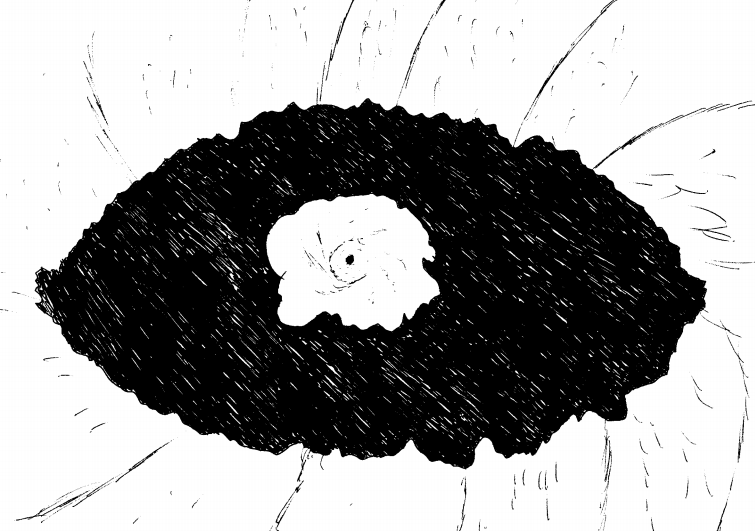 Allen: Is it an eye? ███████: No, but it can see. Allen: Why did you cover your office walls with drawings of S-01? ███████: I'm… still not sure, really. I started to see it even when I closed my eyes. I suppose I was almost drawing it subconsciously. Allen: What do you know about S-01? ███████: No more than you do, really. Deep down you know the truth the same as I. When it comes for us it will be kind enough to leave no corpses behind. Allen: Are you aware of S-01's current designation as a cognitohazard? ███████: I don't doubt they'd label it that way. They have narrow minds. Allen: Do you currently understand yourself to be under the influence of a cognitohazard? Allen: Do you remember what you did to Researcher Johnson? ███████: We named the telescope Parmenides. Have you ever read his works? Closing Statement: After this point ███████ stopped responding to Researcher Allen's questions. Allen eventually ended the interview once he realized this. ███████ has since been revoked of his status on the RPC-313 team. His current designation is RPC-313-1. Foreword: During his last talk to an audience regarding RPC-313, Board Member ██ relayed a story about a dream as an answer to a recruit's question. Transcript: "…I had a dream many, many years ago. Though, I can still vividly remember it, better even than some of my actual memories. I've sat on it for a while, but I think… it's time to share it with you all. I imagine might be helpful… to one of you. It was a couple months after we discovered the simulation, the implications were weighing heavily on my mind. 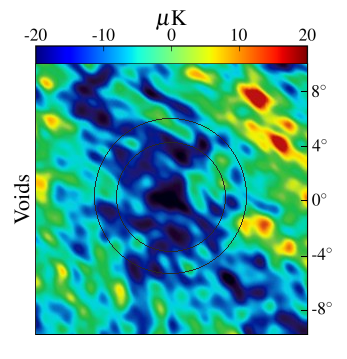 We had been looking into the Fischer-Greiss Void for a while, the fact that it was seemingly expanding was concerning to us long before we intercepted the signals. It was all downhill after we discovered that godawful thing in the center. After a few weeks of feeling that existential weight on my shoulders I had the dream. It began as most of my dreams did at that time, opening my eyes lying on the ground. As I opened them I became privy to the wondrous garden around me. I stood up and began to wander the dazzling gallery of natural wonders. It was as if each singular plant had been immaculately maintained personally by a gardener with great prowess and precision. There seemed to emanate from the place an ethereal glow, one which warmed me to my very core and gave me a sense of not only calm but a deeper feeling of confidence and optimism in myself and my life. I haven't felt anything like that since. Soon, my wandering was halted by the discovery of a small stream. Only about two feet wide, and a few inches deep, though it was able to capture my attention. The water was odd, to say the least. Though it was obvious the stream was incredibly shallow, the water istelf was dark and difficult to see through, as though it were actually several miles deep. Regardless, my wandering now had some form of purpose as I was now attempting to reach the source of these waters. As I meandered upstream I would periodically come across a somewhat larger stream that my current path had branched off from. This happened several times before I reached any destination. After some time of following this stream I finally came upon a clearing, in which was set a small grassy hill. The grass which cloaked the hill had a bright green gloss which contrasted with the murky water flowing down the hillside's streams. Atop the hill sat a modest hut of some antiquated construction. There was a strange aura which hung over the quaint abode, one that caused me to feel a great… fondness and nostalgia for the place, as if I had been born and raised there. A wave of emotion flooded over me looking at the home, as though I had been searching for this place my entire life and finally found it. I felt a significant weight drop from my very being as I approached the entrance to the modest hovel. I knew… somewhere… deep within me that I would not soon forget whatever was about to transpire there. At the center of the shack was an odd stone structure, filled with water, around two or three feet tall. It appeared to have been built around a natural wellspring, the dark water flowing from its openings outside into the garden. This was the source of the streams I had been following. Sitting across from me was an elderly woman, her hands in the water of the wellspring. Upon looking at her face I found myself smiling, though I was unsure why. When she noticed me she reciprocated the smile, her gaze motherly and calming. When she spoke, it sounded like a symphony to me, harmonious and moving in a way I cannot quite describe. She asked me, "What troubles you, child?" I responded telling her of my troubles, describing the despair that now seemed like some distant memory. It's strange, though I can remember her words with near perfect clarity my own are clouded and hazy. She responded "Oh… so it's the heavy burden of despair which plagues your mind." She removed her hands from the wellspring and the flow of the water increased ever so slightly. She continued, "Though I know it is unfair, you must understand the nature of your burdens. You must know that though you should not be made to bear these burdens, it is your duty. There are things much more dangerous than despair that now weigh heavily on you." She gestured to the wellspring, the flow of water now dangerously strong, the water looked as though it were boiling, churning from the sheer force. "Take the wellspring for instance," she said, "it is the most important force in this garden, its waters are required to keep the living things here fed and happy. Without the wellspring there would be no garden, for the garden grew from it. But it is a strange and fickle thing. Older than the garden. Older even than me. It understands only its waters, and its most unknowable and archaic desire is to see its waters flow, unhindered." As she spoke the waters of the wellspring began to spew forth at an incredible rate. I could feel that it was beginning to flood the hut. I tried to leave, the door would no longer open. "It wants only for its water to flood all things, to grind away at the world until there is nothing left but a vast, empty sea. For the flow to gnaw at the sides of the mountains until all that remains is the abyss in-between, the garden and everything with it returned to the formless dark waters from which it grew." The water had reached my neck, I was for some reason unable to move. Fear and anguish had rendered me paralyzed. "It is my burden, the burden of all life to keep the perverse desires of the wellspring at bay for the good of the garden." I was now straining to keep by face above the water, to keep my breath my own. "If I should slack for only a few moments, the wellspring will enact its will. It will flood and wash away all the life that grows here." As the waters finally overtook me, she finished: "So you see, if you let an insignificant thing like despair defeat you, there are burdens incomprehensibly more important that will crush you without a second thought." I awoke quickly, convulsing in shock of the experience. I calmed down after several minutes, progressively calming my breathing. It was a profound pleasure merely to feel by unhindered breath, to be alive. For the first time in decades, I began weep slowly. The weight of the lesson crashed over me seemingly all at once. Despair had, in that moment, utterly defeated me. But let it be known by any powers that may be listening that it was the last time. The lesson did take. I… understood." 1. Specific causes of the memetic effects of S-01 are still being researched. 2. The average cosmic void falls around >10%. 3. A measure of the coherency of reality. A brief summary on the ACS can be found here. 4. The two Interstellar Observers are being propelled via ██████. 5. The space S-09 occupies could itself be classified as a cosmic void. How pitiful we must seem, as it watches us. The only thing we can do is narrowly escape. Since the beginning we've been running. Constantly tearing ourselves apart just to get further away. Femtosecond after femtosecond, atoms to galaxies widening the gaps between themselves. Expanding into the space around them, pushing each other away. As we run it trickles into the gaps. It pushes us to keep going, faster and faster. Superclusters inflating at a quickening pace. Every number is a step forward in the endless race. Every disaster averted brings us closer to the edge. Is the spiral widening or closing? Are we running away from or running to the end? Continuously, the expansion of the cosmos accelerates.